Consumers love the look and feel of the all new 2014 Denali. This was already a popular vehicle among drivers, but the popularity is extending as a direct result of some serious upgrades. People are getting ready to test drive the new engine that is designed by GMC for the Denali. The 6.2 V8 engine is being held as the high performance engine that was just what the Denali needed to become a contender with all the other high performance vehicles. The competition is strong, but this vehicle has managed to overshadow many of the competitors. The fact of the matter is that there are no other trucks out there with this type of horsepower thanks to this new engine. That is why there are so many press releases about this new vehicle. 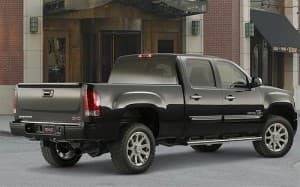 In terms of power the GMC 2014 Denali will have more towing capacity than any of the competitor vehicles in this class of trucks. Lots of people love to compare trucks because there are so many advertisements about the different aspects of tough trucks that perform well under strenuous conditions. The competition has been brewing with other vendors like Ford for years, but GMC has finally gained some leverage. This Denali looks great inside and out and people love what is under the hood. That makes this one of the most promising vehicles for the 2014 lineup of trucks. The Denali has not been around as long as some of the other GMC staples, but incredible upgrades like this will ensure GMC that this vehicle will have a long life. That is why people appreciate the efforts of engineers that have worked diligently on the redesign. This new Denali can tow up to 12,000 pounds. That is impressive to drivers even if they do not do any towing on a regular basis. It is a feature that represents the power that this new vehicle has. It represents a milestone in development that has become the core of GMC work. So many people are interested in what GMC is doing with cars. People that are fans are definitely excited about such big news. Drivers that are looking for a vehicle have so many choices to make. It is definitely wise to consider the Denali in 2014 if power is part of the requirements. The 6.2 V8 makes this one of the best buys for drivers in 2014.